The Florida Polytechnic Board of Trustees held a retreat February 4th and 5th and the Hyatt Regency located in Orlando. This press release was issued afterward. LAKELAND, February 5, 2013 – Florida Polytechnic University’s Board of Trustees met in Orlando today to continue the task of developing a business plan, which among other things, lays out an initial academic vision for Florida’s newest public university. As part of its organizational process, the Board heard presentations from academic consulting firms MGT America and The Parthenon Group. Among the recommendations, the consultants said Florida Polytechnic’s academic offerings should respond to global economic trends and the demands of Florida’s evolving industry landscape. As such, an applied science, technology, engineering and math (STEM) curriculum was proposed. 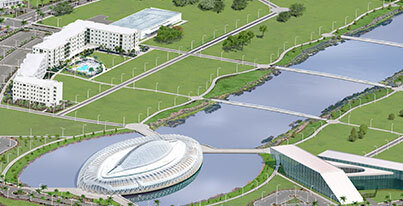 Similar to the Arizona State University Polytechnic model, the consultants suggested that Florida Polytechnic should encourage a hands-on, project- and team-based learning environment where students would become equipped with the skills needed to compete in those industry sectors that are beneficial to Florida’s future. While curriculum details and degree offerings are yet to be defined, presentations suggest that they would focus on application, management and innovation within the business of STEM. Furthermore, the consultants stressed the critical importance of creating an institution that is competitively positioned to achieve high graduation rates and measurable success in job placement. The proposed business plan outlined a strategy where lower division, upper division and some graduate level courses would commence in fall 2014 for approximately 250 students. That number is expected to increase to 2,000 students by 2016 and 5,000 by 2019, with additional students engaged via on-line learning. In addition to providing insight to an academic vision, the consultants briefed the Board on the Southern Association of Colleges and Schools (SACS) accreditation process, which forecasts accreditation for Florida Polytechnic within approximately four years of admitting students. Following the consultant presentations, the Board discussed future challenges associated with building facilities and hiring faculty and staff to accommodate a dedicated polytechnic facility. Among these challenges, include the potential need for approximately $25 million in additional funding to complete the University’s first phase of campus construction. The Board is expected to reconvene in a month’s time to evaluate its strategic planning process and budgetary assumptions.